Obama might be ahead in Arizona. Scared Monkeys Discussion Forum > Current Events and Musings > Political Forum > Topic: Obama might be ahead in Arizona. in last poll McCain was 7 points ahead. but this was before the economic crisis. Re: Obama might be ahead in Arizona. Why when we all know polls aren't truly empirical evidence, do you insist upon these types of posts? I am far more interested in what's happening in my own 'swing' state currently. I was at our community street fair this weekend, the sheriff and police departments had a booth and were discussing the need to respond over the last two weeks to numerous complaints about Obama supporters beating down the doors of voter's residences and "harrassing" them if they didn't listen to or commit to voting for Obama. I'd have them all arrested for trespassing, regardless of the party you represent you have no right to engage in these types of tactics. FYI, McCain posters are stolen in our county within hours of their posting in yards or in any public place. The tactics are reprehensible which I think also represent the mindset of Obama - by hook or by crook. in latest poll McCain is only 2 points ahead in Arizona. A statewide poll taken by Tucson-based Democratic pollsters Carol and Pete Zimmerman two weeks out from the election suggests McCain's lead over Obama falls within the margin of error: 43.5 percent to 41.5 percent, with 10 percent of likely Arizona voters undecided. and about those McCain posters being stolen, same happens to Obama posters. 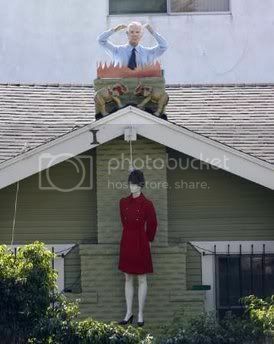 but here is a racist McCain supporter hanging Obama in effigy from a tree. and watching these crowds coming the McCain/Palin rallies, a lot of them are hateful racists. i hope the Republican party can clean themselves of these racists. maybe let them form a new party. yes there are some rascists but there are also an equal number of socialists in the right wing and those are just as offensive. You might be surprised to know that media in our state had small business owners all over the news tonight, discussing how they refuse to work so hard and just 'give' away their earnings to those too lazy to work hard. I happen to agree with them, just as I agree with the movement to strike down the 200M+ scheduled to be paid to the CEO's of the nine largest banks for this year. I think many on this thread have well proven the lack of reliable data within polling so I just won't respond to your posts about it any longer. As for race, it's Obama and Michelle that just had to play the race card - they did so because they knew it would inspire many black americans to vote for the first time. Shame on Obama, shame he can't stand on his own merit without buying votes from less educated or aware voters. so you compare racism with socialism?? how does that work? but i hope you are smart enough to not be fooled by the anti-Obama propaganda accusing him of being a socialist. he is far from that, much more a centrist. i might remind you that Bush is very good friends with Tony Blair, a social-democrat. the recent bail-out and taking over of banks, THAT comes a lot closer to socialism. putting the tax rate 4% higher for 250k earners, back to where at was during the 90s is just common sense. McCain on the other hand, wants to continue to 'spread the wealth' to the elite - while screwing the workers. 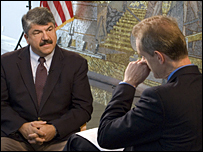 In a HARDtalk programme broadcast on 21st October, Stephen Sackur talks to the Secretary Treasurer of the AFL-CIO, Richard Trumka. Earlier this year he gave a passionate speech calling on the labour movement to reject the politics of race in order to elect Obama to the White House. you are gravely mistaken if you think most Americans agreed with the move to bail out these banks over this sub-prime debacle but even Warren Buffet felt there was no other alternative. You do know who Warren Buffet is, right? Obama is not a centrist, he's a card - carrying socialist and I stand by that accusation with confidence. Did you miss the video that CBB posted regarding Fannie Mae and Freddie Mac with closing comments by Clinton admitting to the democrats role in not placing any controls on them? You should watch it. A 4% higher tax rate on $250,000 income earners is not the Obama tax plan. The Obama tax plan includes raising the capital gains tax (now THAT should encourage investors and make everyone flock back to a dying Stock Market! ), increasing the small business tax from the already second highest on earth at 37%, to +40%, which will cause those businesses to do two things: reduce the number of workers and/or pass the increase in expenses on to the consumer, which should do wonders for an increasing unemployment rate, create a new death tax, which will encourage people to take their money OUT of banks to avoid being reported. That should make the liquidity problem banks are having just be peachy keen, and levy tax penalties on small businesses that cannot afford to provide comprehensive health care to all employees. Hmmmmm, do you think that might keep entrapeuners from being able to start new businesses so they can provide JOBS to others? Small businesses, who are the whipping boys of the Obama plan make curious targets, since nearly 100% of all new job creation over the past 2 years has come from them. Let's see now, what was the piece of eloquence used? Oh yes, "McCain on the other hand, wants to continue to 'spread the wealth' to the elite - while screwing the workers". Yeah, I surely wouldn't want to screw the workers. Far better, under Obama's plan to take advantage of the incentives not to work, and draw a check. Free Day Care, Free College Tuition, Free Health Care, Tax Refunds even if you don't pay taxes. What an inspiration to a good work ethic! Ah, that's what makes America Great! I'll bet that will solve the illegal immigrant problem as well. After a few years of that mindset, free-loading Americans will shoot on sight the hoards coming across our border to get their freebies too. What if the money that supports them ran out? Hell no, Americans on welfare should only pimp American workers! Gotta keep it Patriotic! Surely you know there is no such thing as FREE? SOMEBODY pays for it, everytime we buy groceries, or clothes, or anything else. McCain's evil plan includes a tiny overlooked element that is fundamental. STOP GOVERNMENT SPENDING!! Oh, I know, that must hurt Obama's Big Ears, after all, a million dollars a day in pork for his tenure in the Senate, and rising to the rank of 2nd in Fannie and Freddy money, qualifies him for a heart attack at the thought of STOPPING this madness, but really, if he'd just turn over his health records, I'm sure there are fine physicians who would ensure the shock wouldn't be his demise. All those stupid American families who live within a budget have been doing it SO wrong! We need to just go to work and be grateful to bring home 1/2 of what we earn and refrain from opening our mouths. Obviously, the government is so far above our intellect, that we can never grasp the principles of our economy. Just follow that perdy talkin man, and don't ask questions. What joy just to hear his voice! Hark! As I type I hear it ringing! "McCain would give tax breaks to those corporations shipping our jobs overseas!" I've got to practice this no-brain thing. Wonder how long it will take to suppress the obvious response...............if corporations are giving up to taxes 10% of everything they earn elsewhere, why would they stay here and give up to taxes 42%? There are idiots in both parties, and I suppose neither candidate can control who supports their candidacy. In regard to racism, I'm surprised an Obama supporter would bring it up. I do believe that Obama himself CHOSE to attend a church for 20 years to give audience to and be mentored by Rev. Wright. i wouldn't expect anything else from the Heritage Foundation. No shortage of idiots that support either campaign, and not a commentary on either candidate IMO. yes, that's just as sick. it should be denounced immediately. else individuals like these two white-supremacists they caught today think it's somehow warranted to start using violence. Running against any other GOP candidate, the state of Arizona would be a natural battleground for Barack Obama, alongside other Western states that lean toward him, like New Mexico, Colorado and Nevada. But with John McCain as the Republican nominee, a serious push to win Arizona was off the table. Obama’s senior aides are intrigued by several late polls that show a narrowing of the presidential contest in Arizona. Most recently, on Tuesday a Cronkite-Eight poll (named for Arizona State University's journalism school and the local PBS channel) showed the state a statistical tie, with the Arizona senator just 2 points ahead of Obama. That poll suggests Arizona is too close to call, with Obama making significant gains among women and independents. The campaign is now seriously examining a late surge into the state. That may include ramping up TV advertising, on-the-ground staff or even deploying the candidate to stop there. Obama is scheduled to make a Western swing late this week, making an Arizona visit possible. According to Pollster.com’s averages, Arizona is a 6 point race in McCain’s favor, compared to Pennsylvania--McCain’s best hope of picking up a blue state--which is an 11-point race in Obama’s favor. 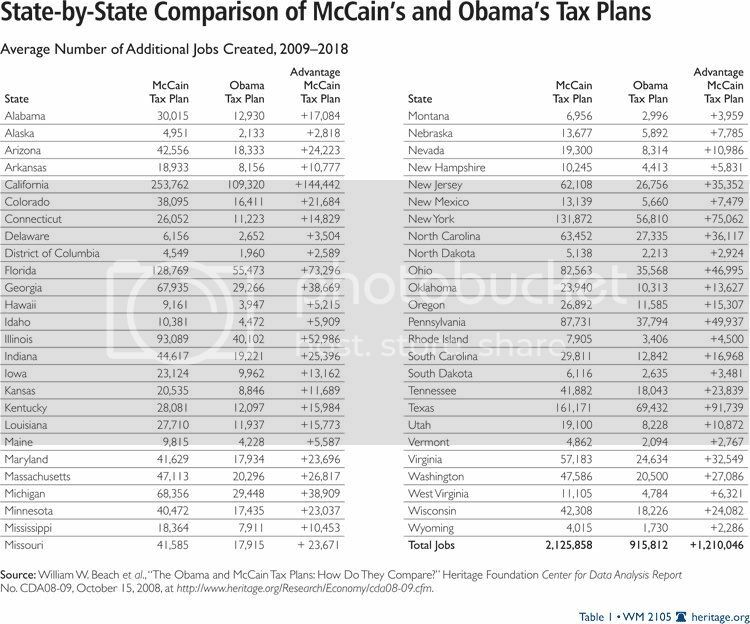 That means Obama has more reason to travel to Arizona than McCain does to Pennsylvania, no matter how far-fetched it once seemed to try to win McCain’s home state.